Written and directed by first-time filmmaker Mark Elijah Rosenberg, Approaching the Unknown is a new space movie starring Mark Strong as a man on a solo mission to Mars who has to keep his ship and his sanity from falling apart. In this exclusive clip, we see his final human interaction before continuing his journey. 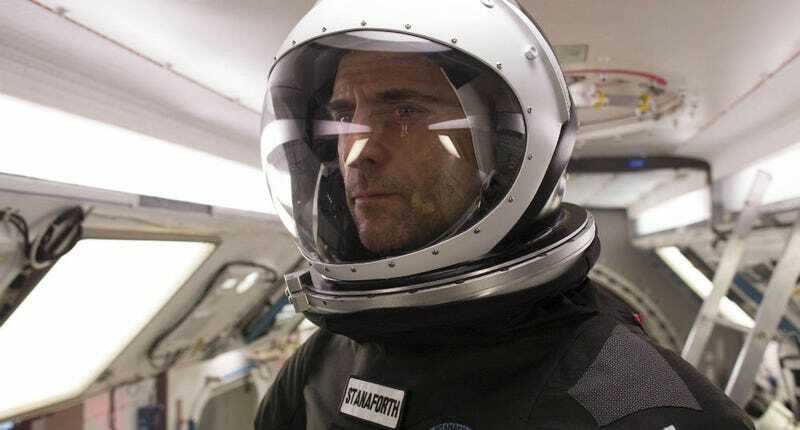 In this scene, astronaut Stanaforth (Mark Strong) makes his final stop at a space station for fuel and supplies, knowing this will be the last person he’ll see for years as he embarks on his lonely mission to Mars, further in space than any human being has traveled. In case you couldn’t tell in the clip, many of the shots of the spacecraft are created with actual, physical models instead of CG. Rosenberg himself talked to io9 about this clip and his movie in general, and why it was made with a strong focus on practical effects—with a little help from a special effects legend. “Because the character is isolated in unknown territory—there’d be no camera crew out there—I wanted the outer space shots to feel subjective, from Stanaforth’s perspective or imagination. So it was important to me to create a visceral, tactile feel to the models and to space itself, and I thought we could achieve that using practical models instead of computer graphics. We convinced special effects legend Douglas Trumbull to let us shoot at his studio in the rural Berkshires, and it was amazing to have the advice of the man behind the models for “2001,” “Blade Runner,” “Close Encounters of the Third Kind” and many others. Our production designer, Steven Brower, knows more about actual space science than some folks I’ve met at NASA, and he designed a ship inspired by genuine practicalities as well as our speculative fiction. I know it was a real challenge for him—one you wouldn’t have with CGI—to make a ship that was structurally sound. Our hero Zephyr was about six feet long, with an eight foot spinning arm, and it had to actually work. I think you can “feel” the size of the thing on screen, how incongruous it is that this giant machine is floating weightless up there. Lastly, I wanted space itself to have a texture. For me personally, the closest I could come to understanding what it would be like to be in the darkness of space would be like being deep under the ocean: it feels empty, but there’s viscosity, and you know it’s teeming with life, much like in space, with radio waves and subatomic particles, space dust and comets, planets and stars. So we shot all this footage in “cloud tanks” filled with glycerin, corn syrup, salt water, into which we would inject dyes and powders and metallic particles. Again, you get these incredible tactile effects that are unique to the materials, and which I think create a subjective mood of growing madness and beauty that is fitting to the story. I’m really proud of the special effects in the film, and one of the best things about doing them practically was just how fun and creative it was. A huge, stressful challenge, but a joy to achieve. Approaching the Unknown hits select theaters, on demand and digital HD this Friday, June 3. Here’s the full trailer.